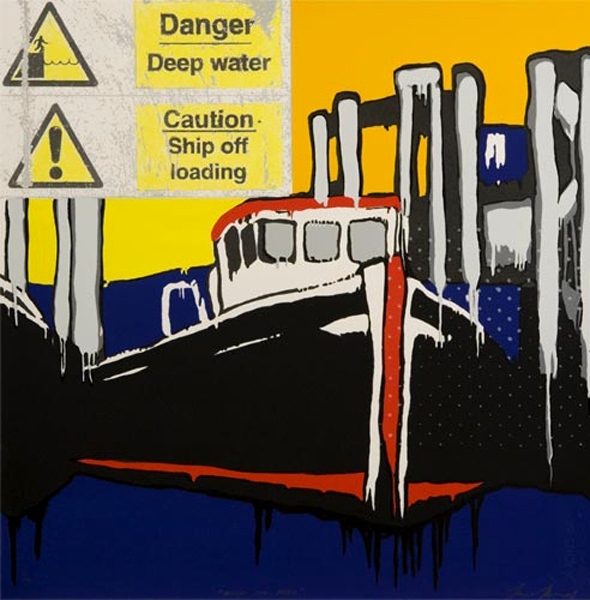 This silkscreen print by Jasper Knight was Released in April 2008 the edition was only 40; the image size is 77x77cm, there where 11 colours used. Jasper Knight quotes – “I was planning a show in London last year (2007) so I hired a tugboat and went down the river Thames for a whole day and saw that it is a working harbour. I usually use a mixed media for my paintings; enamel, Masonite, Perspex, old signs, building materials, anything with an industrial feel. It was an exciting challenge to use the different medium of silkscreen for these new works and I am delighted.